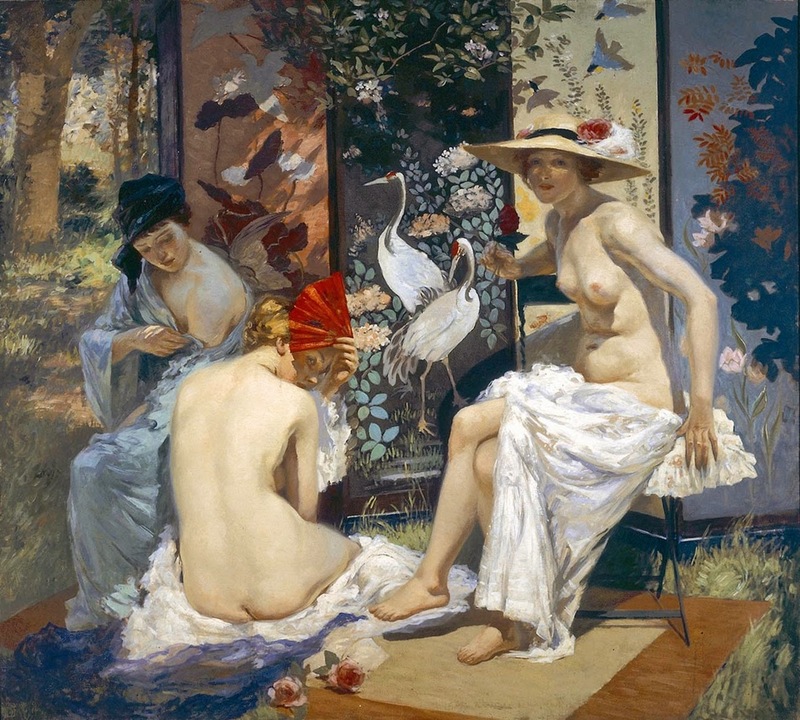 Australian painter Rupert Charles Wulsten Bunny** (1864-1947) was one of the most successful expatriate artists of his generation. 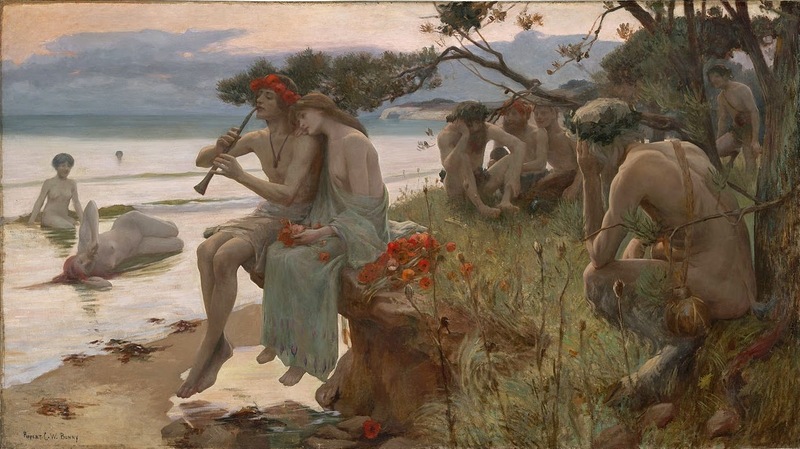 No other Australian artist** achieved the critical acclaim that he enjoyed in Paris. 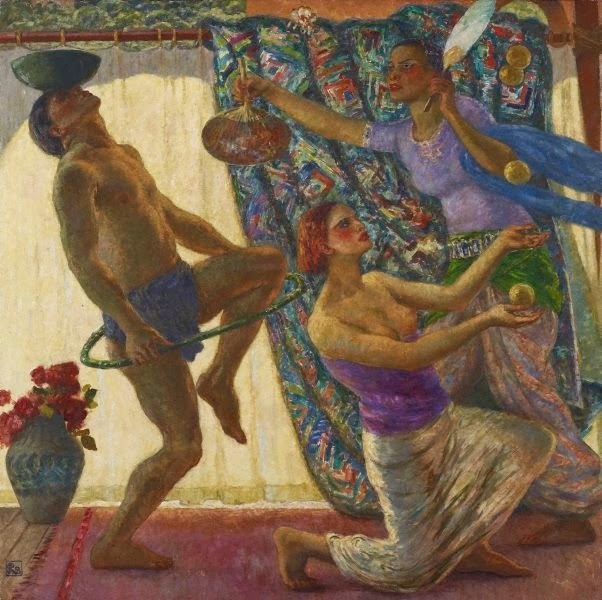 An erudite painter of ideal themes, and the creator of the most ambitious Salon paintings produced by an Australian, Bunny is an exotic in the history of Australian art. 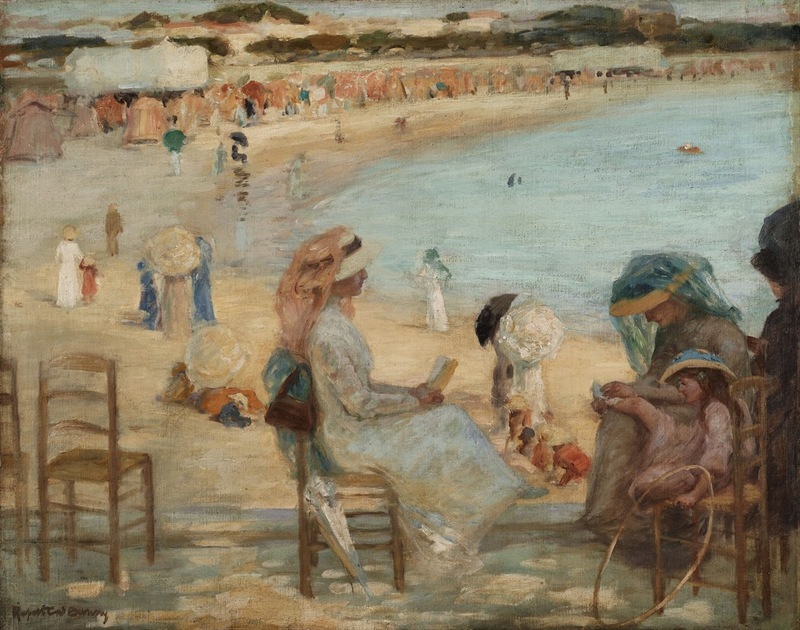 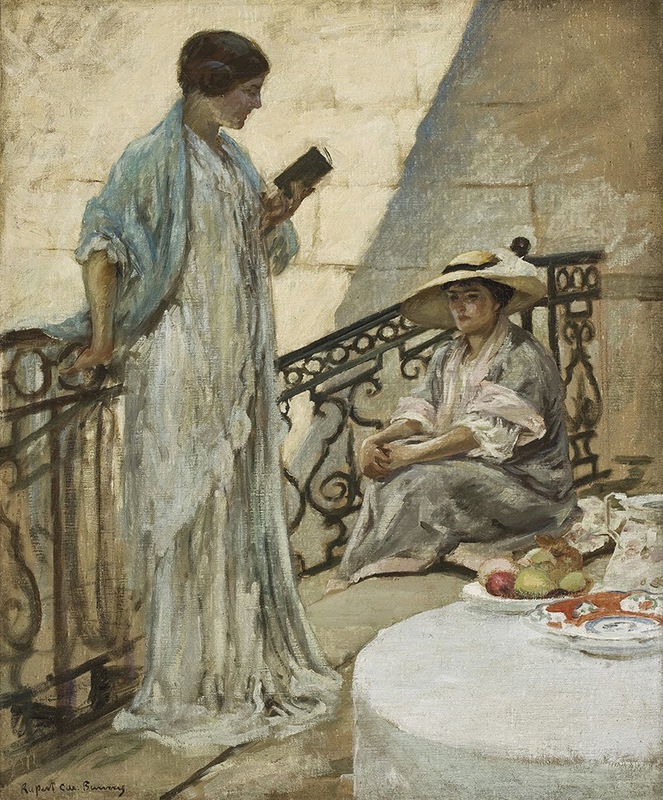 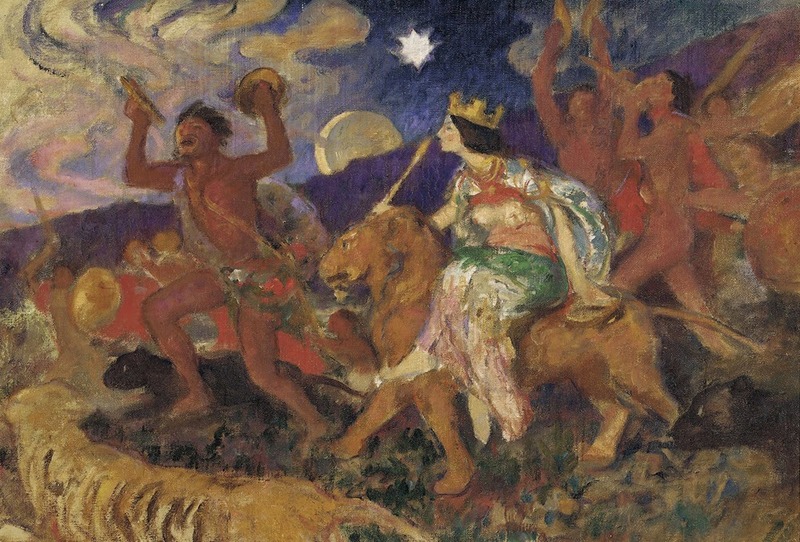 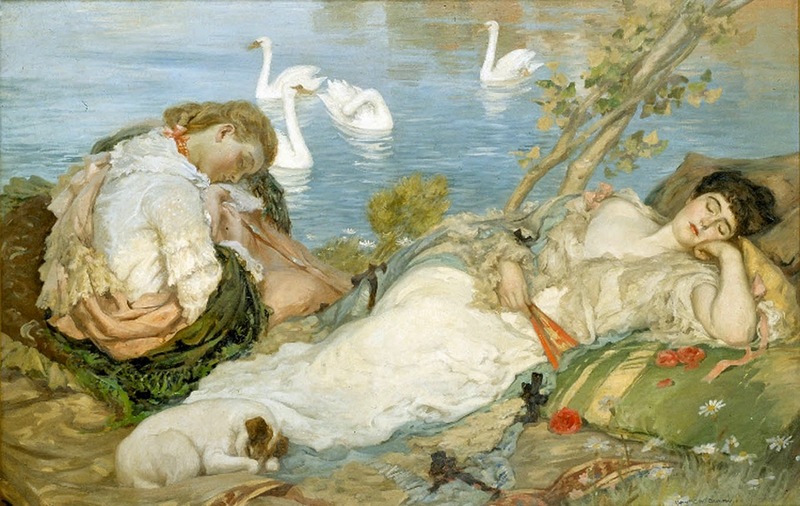 An exhibition, Rupert Bunny artist in Paris, curated by Deborah Edwards, Senior Curator of Australian Art, will honour the work of this great Australian artist. 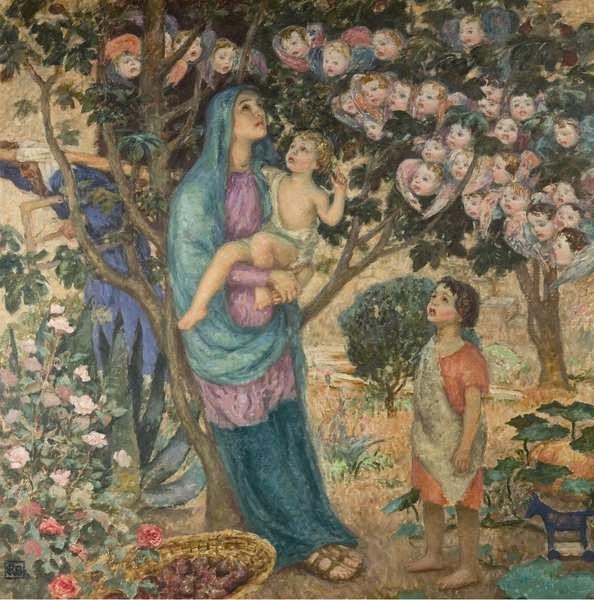 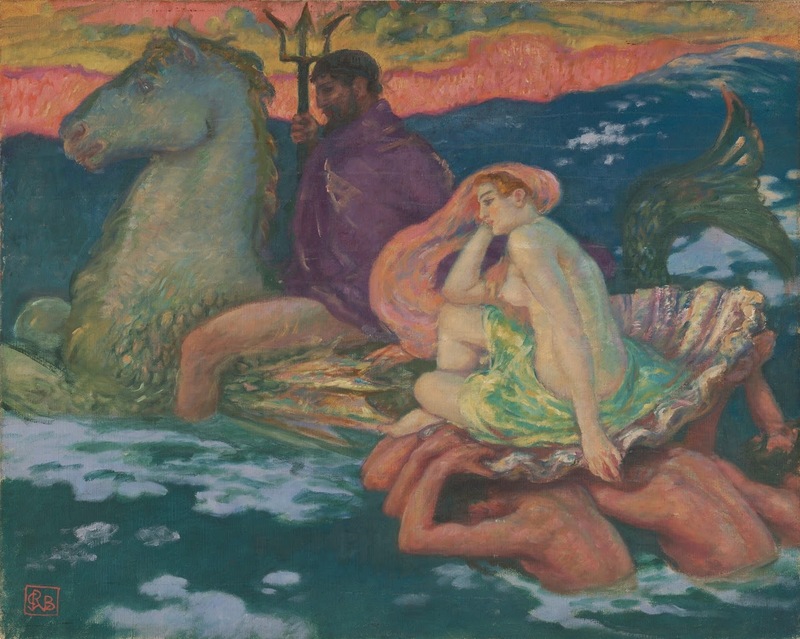 The exhibition at the Art Gallery of New South Wales will showcase more than 85 of his most significant paintings, many unseen in Australia, including works from the Musée d’Orsay and Fonds national d’art contemporain in Paris and private lenders including Kerry Stokes, Jeffrey Archer and Dame Elisabeth Murdoch. 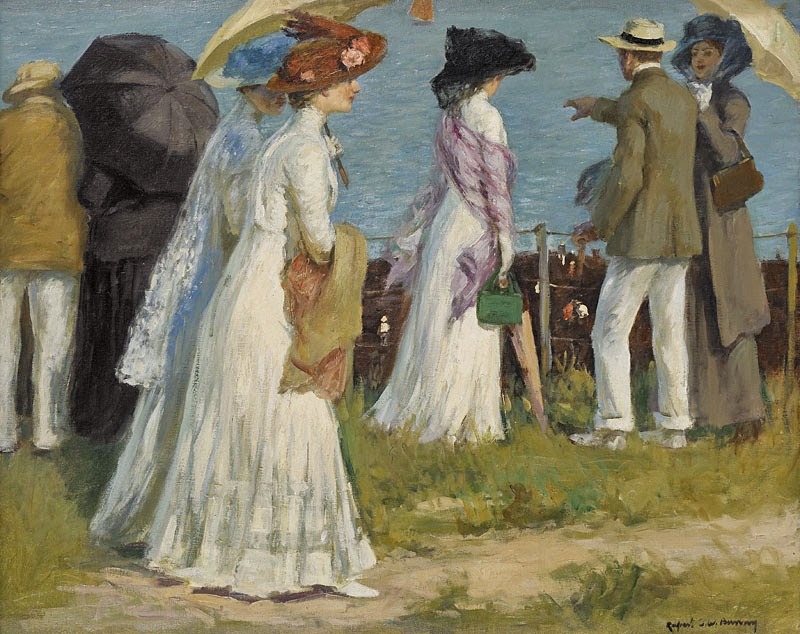 As a serious musician, fluent in French and German, and one of seven children of a prosperous Melbourne family, Bunny left Australia in 1884, accompanying his father, Victorian Judge Brice Bunny to Carlsbad. 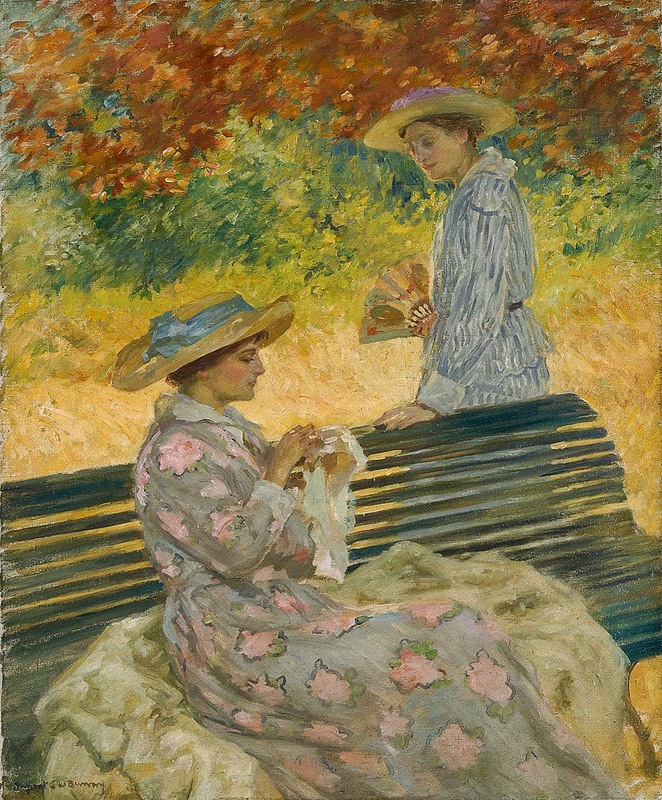 After brief study in London, he settled permanently in Paris. 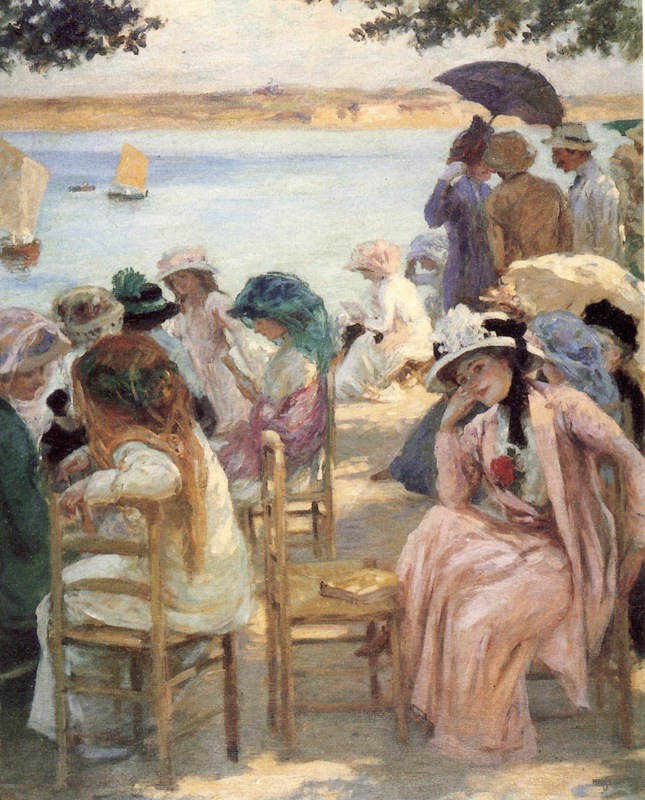 Whilst he joined Melbourne colleagues such as Bertram Mackennal and Charles Conder as expatriates in Europe, Bunny lived outside the characteristic experience of an Australian in Paris: he associated closely with American and French artists, he married a French woman, (the artist and model Jeanne Morel) and he remained in France for five decades. 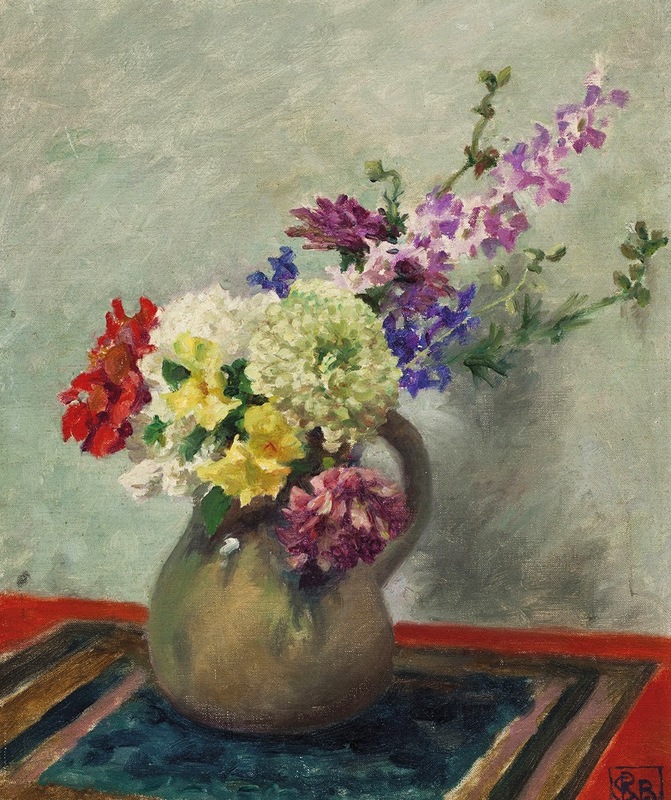 He returned to Australia permanently in 1933, nearly 70, recently widowed and in financial difficulty, and spent the remaining years of his life in Melbourne in genteel poverty, painting and pursuing his love of music. 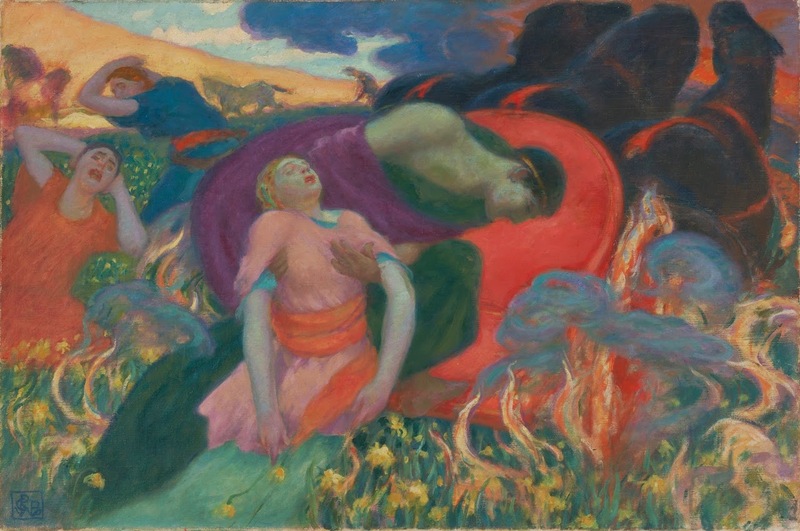 Bunny worked consciously to align his art to the great masters and traditions of European painting. 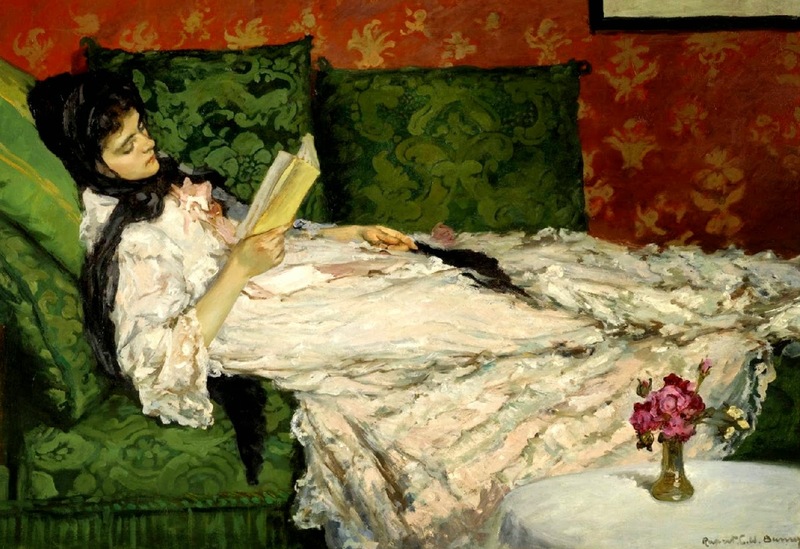 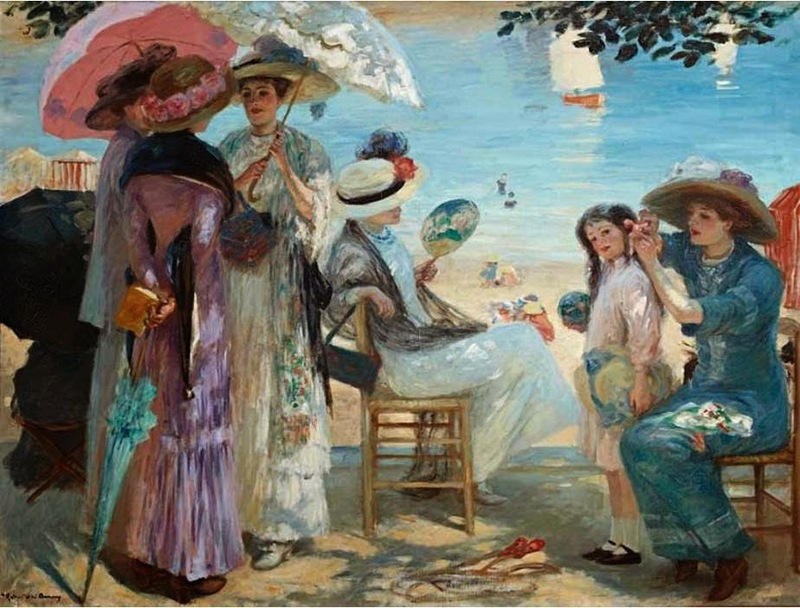 The Italian primitives, Venetian colourists, British Pre-Raphaelites, and tonalists Manet and Velàzquez captivated him. 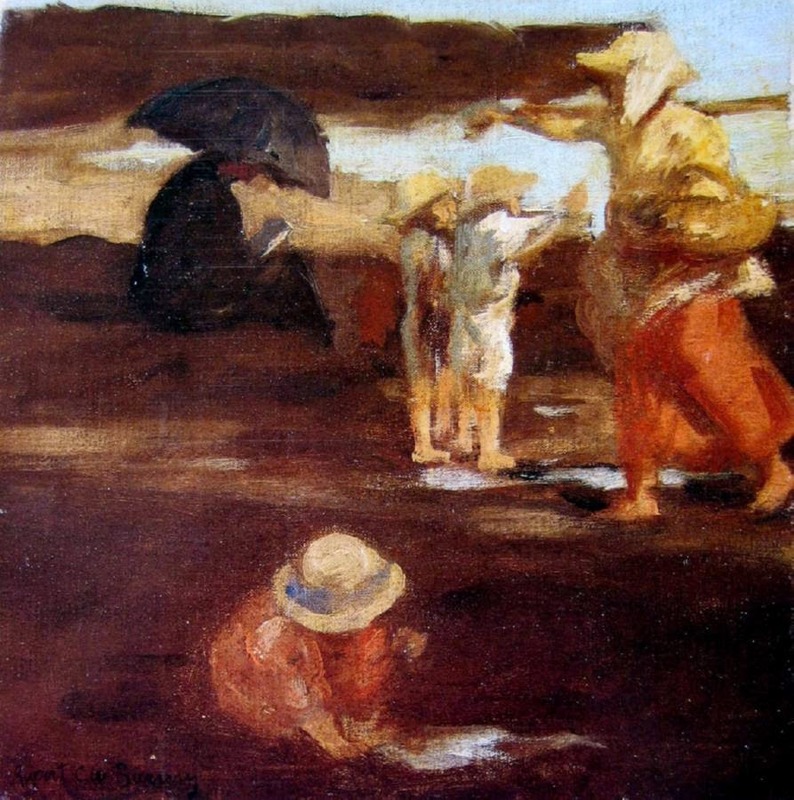 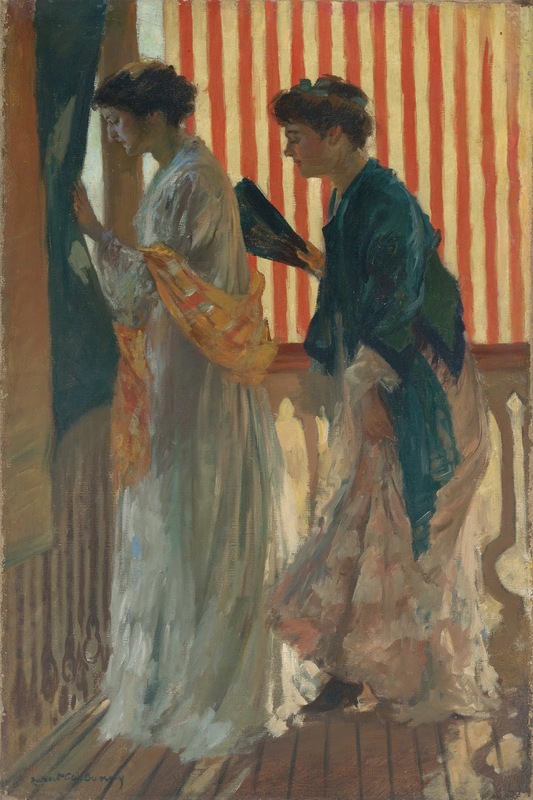 But he also wished to be a modern painter, and established masters of his own time, from Whistler and John Singer Sargent to Gauguin, Bonnard and Matisse also had great impact. 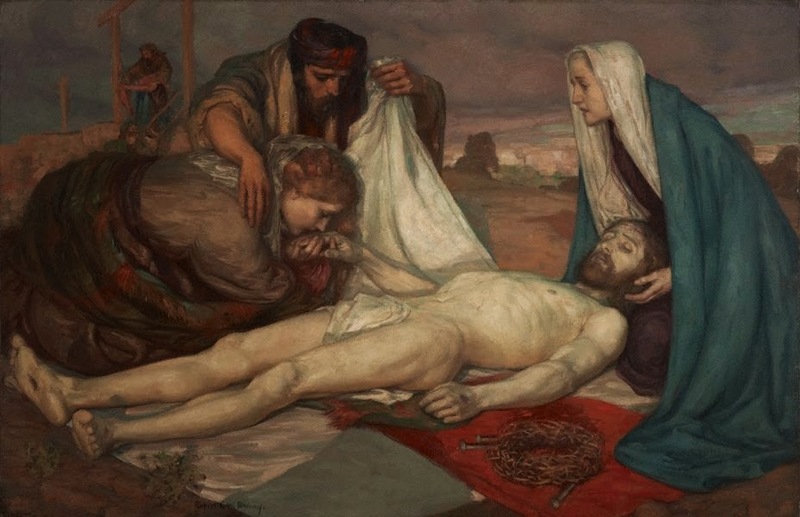 During his decades in Paris, Bunny accumulated a string of successes: he was the first Australian to gain honourable mention at the Paris Salon (in 1890 with Tritons), gained a bronze medal at the 1900 Paris Exposition Universelle (with Burial of St Catherine of Alexandria c1896), held a string of solo shows, and exhibited throughout Europe. 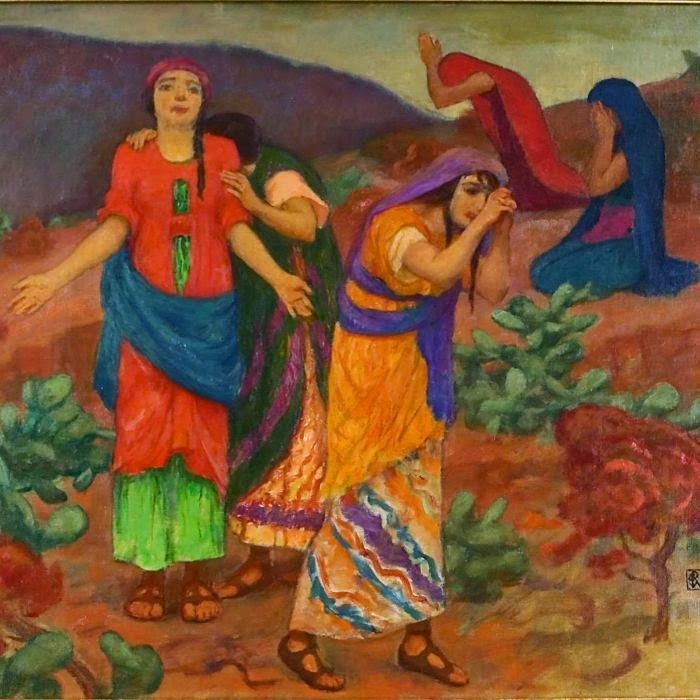 Bunny was patronised by the French state which had, by the end of his career acquired no less than 13 of his works for the Musée de Luxembourg and regional collections – a first for any Australian artist. 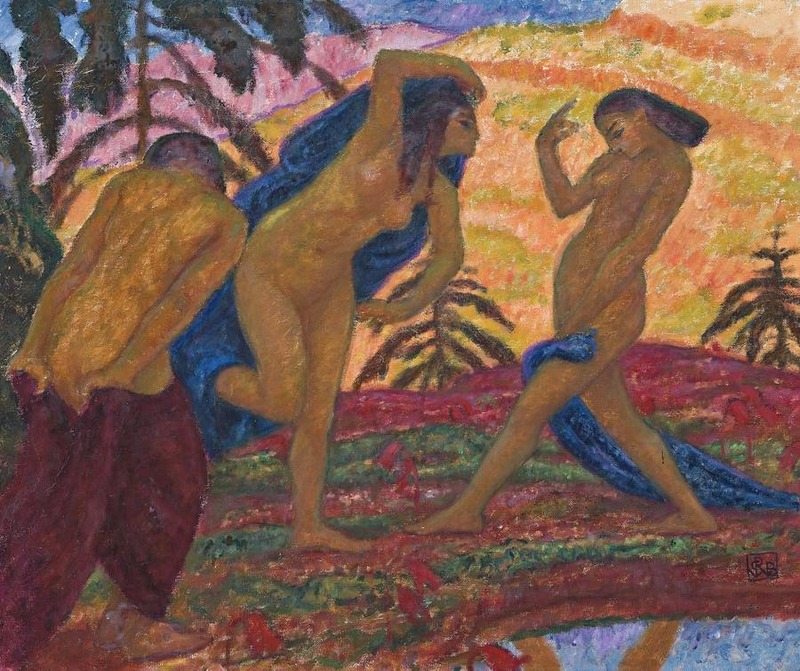 His art was acquired by Hungary’s Museum of Fine Arts and National Museum, by the Wilstach Collection in the Philadelphia Museum of Art, and by collectors across Britain, Hungary, the US, Chile, Argentina and Russia. 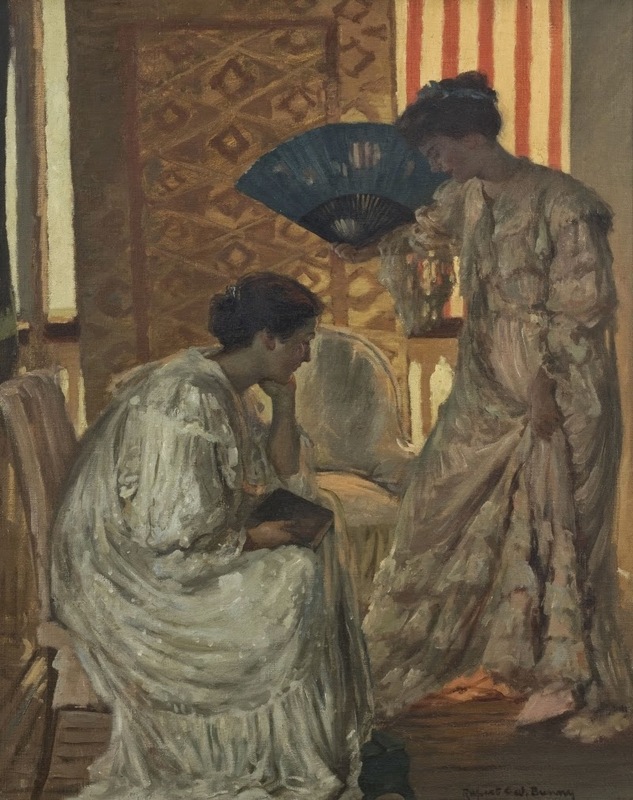 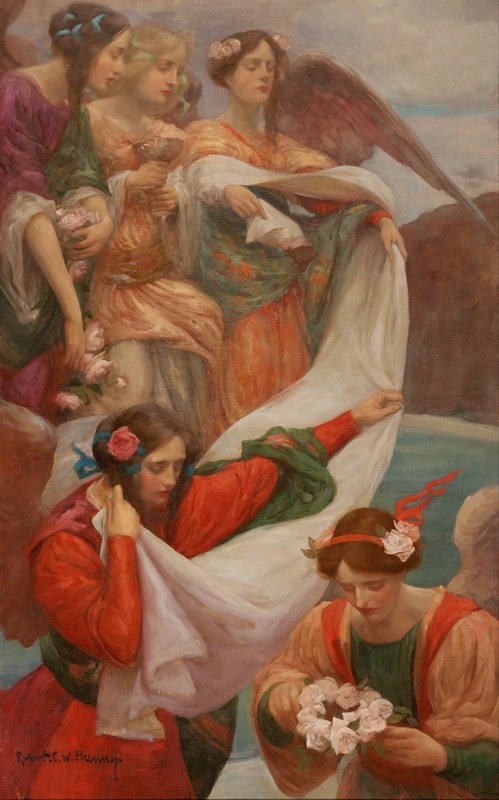 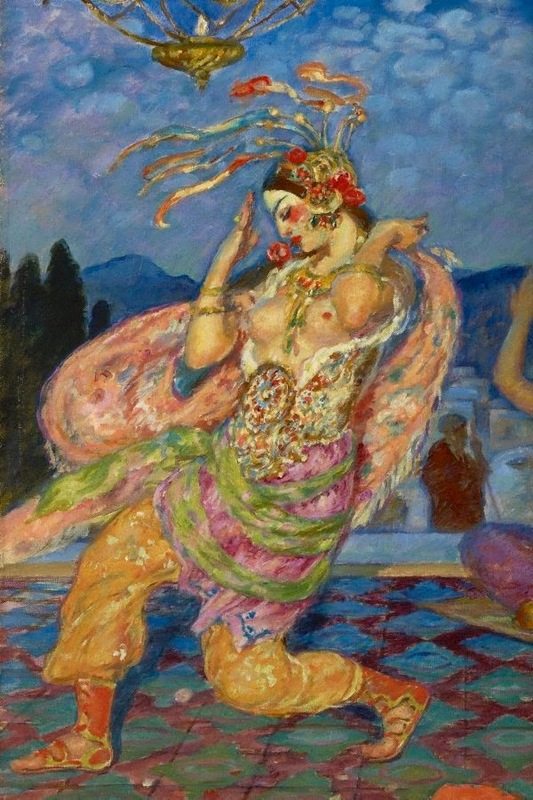 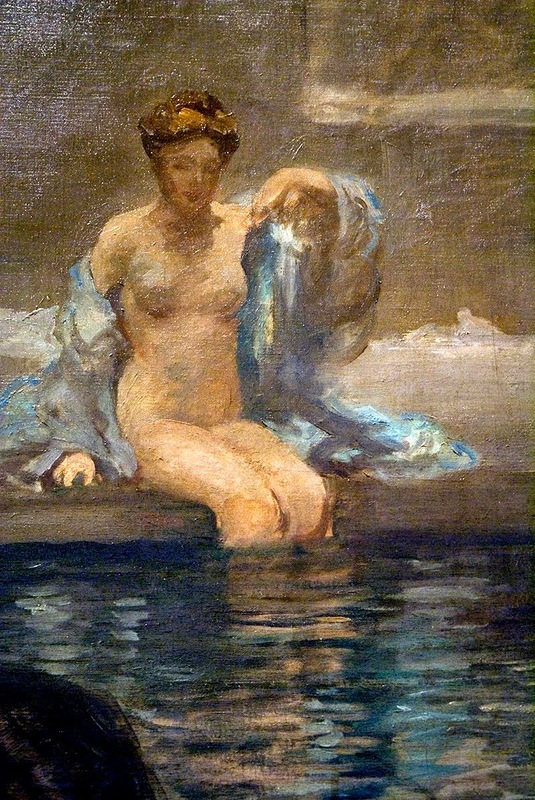 When Scottish millionaire George McCulloch exhibited his collection at the Royal Academy in 1909, Bunny’s Summer dance c.1894 was the only Australian painting shown amongst major works by Whistler, Millais and others. 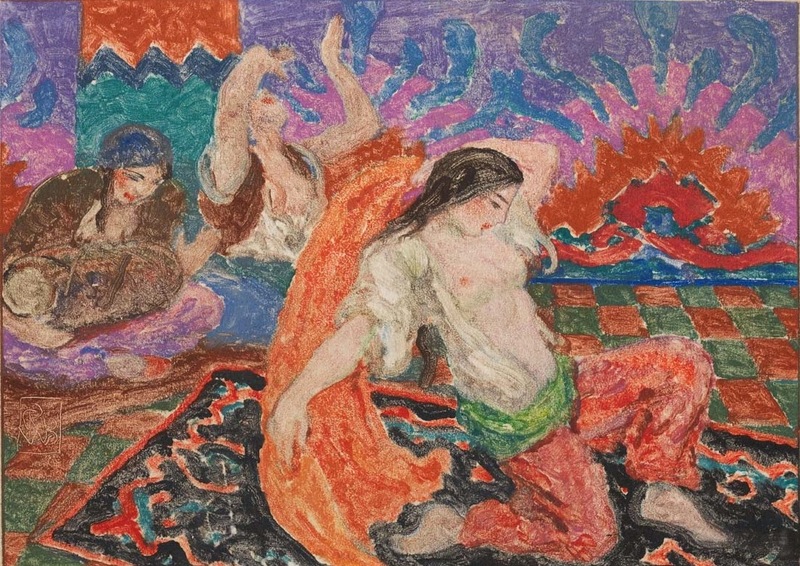 In Australia enthusiasm for Bunny’s great mythological Salon paintings, his sumptuous portrayals of Parisian women at leisure, Provence landscapes, and his monotypes have successively gripped collectors and galleries since the 1940s. 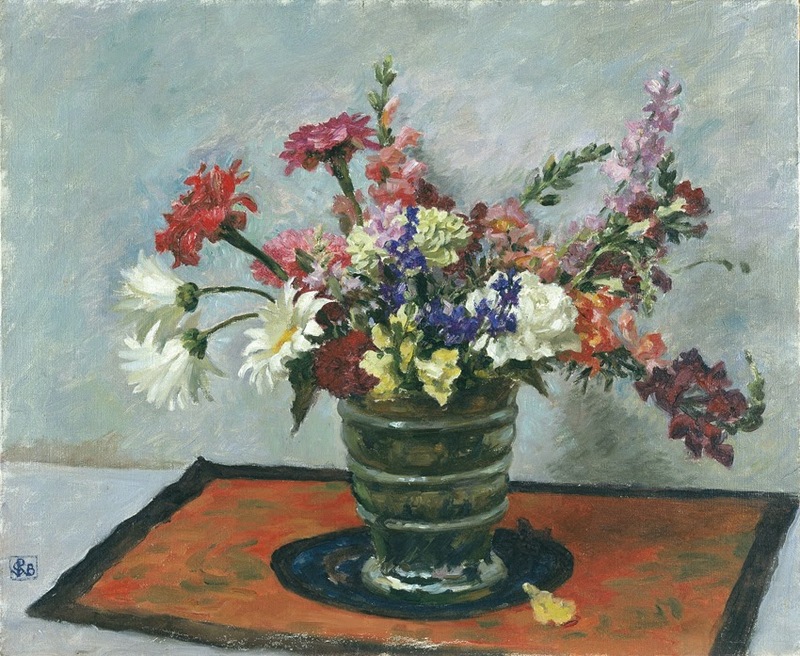 Such was his standing in Melbourne after his return that the National Gallery of Victoria mounted its first retrospective on a living artist on Bunny, in 1946. 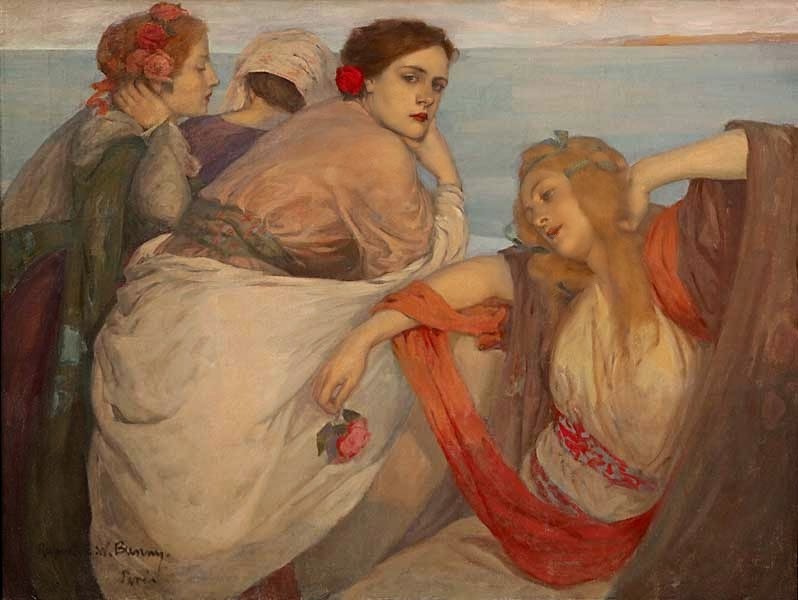 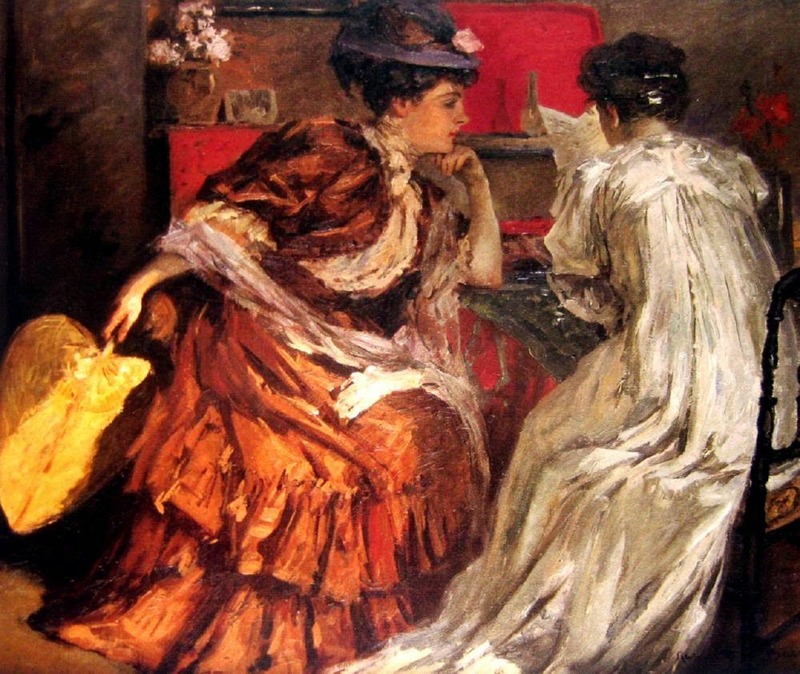 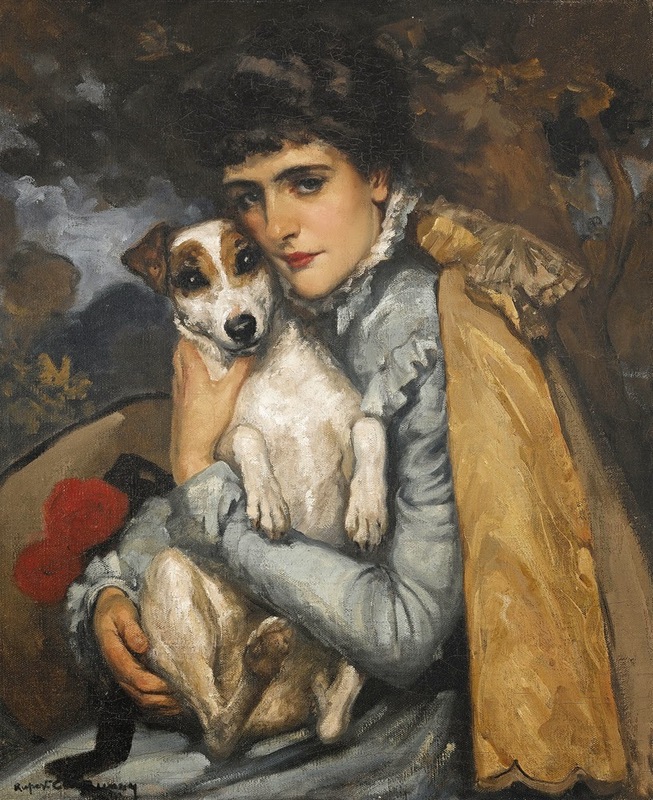 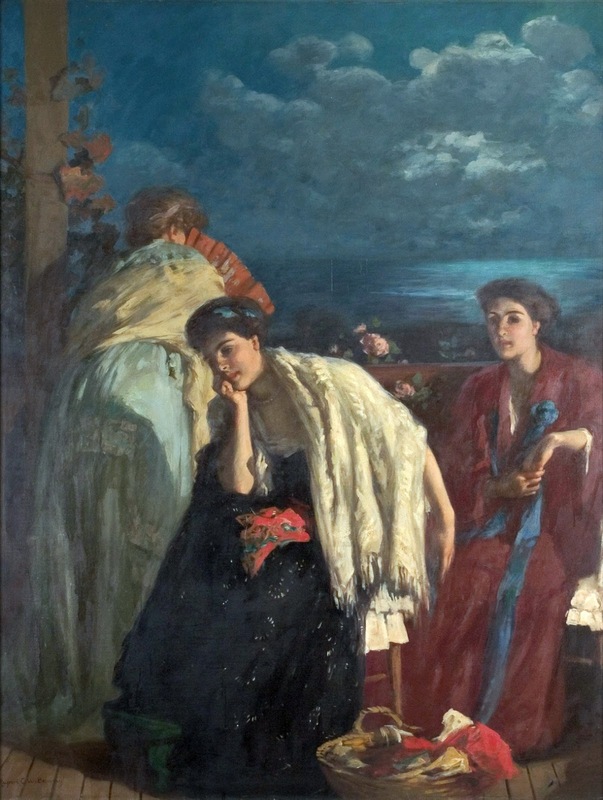 Yet, despite his formidable successes, Rupert Bunny is not a household name in Australia. 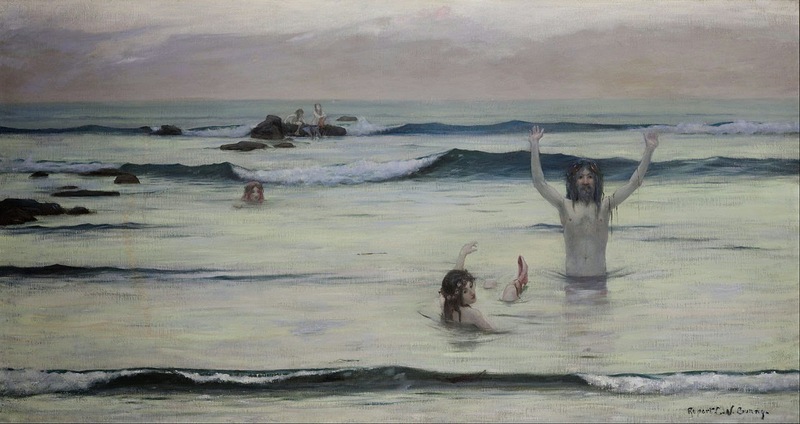 Bunny experienced the ongoing fate of the Australian expatriate; largely dismissed from attention once leaving local shores. 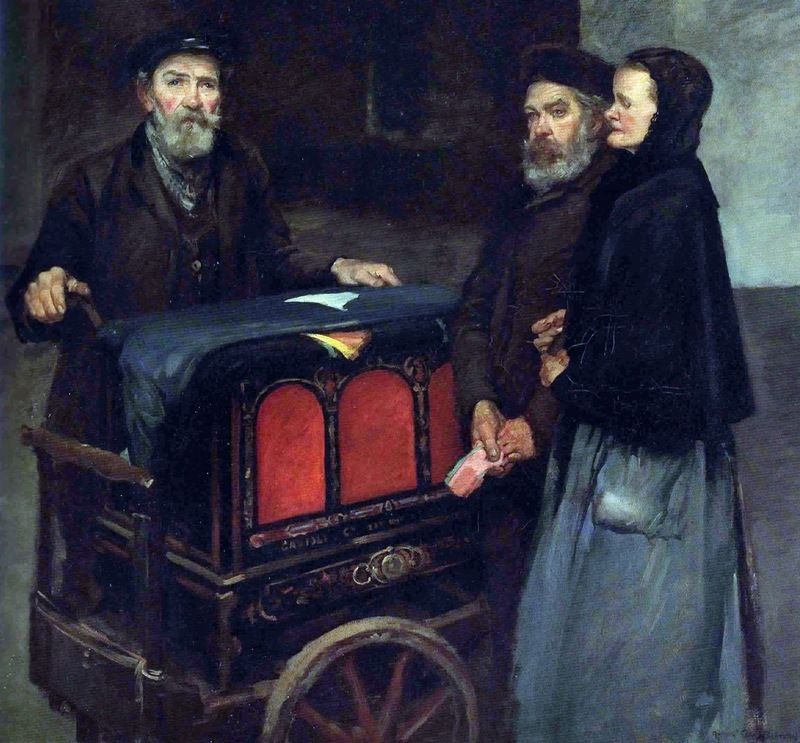 Bunny however, was offered French citizenship and with it official commissions, but refused. 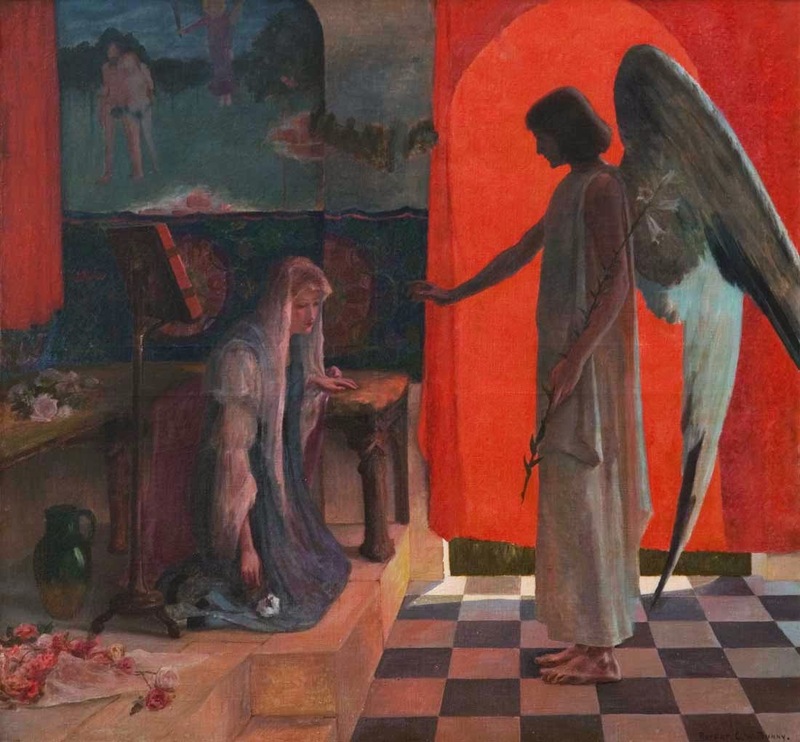 The details of Bunny’s life and art have been elusive. 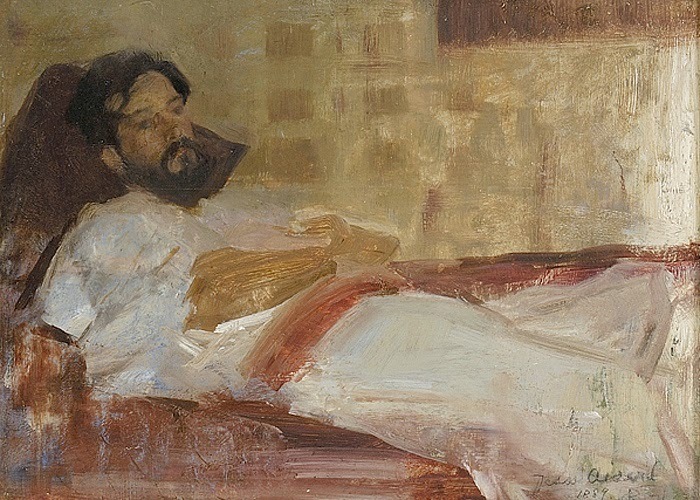 His secretiveness encouraged speculation, as do his enigmatic self portraits. 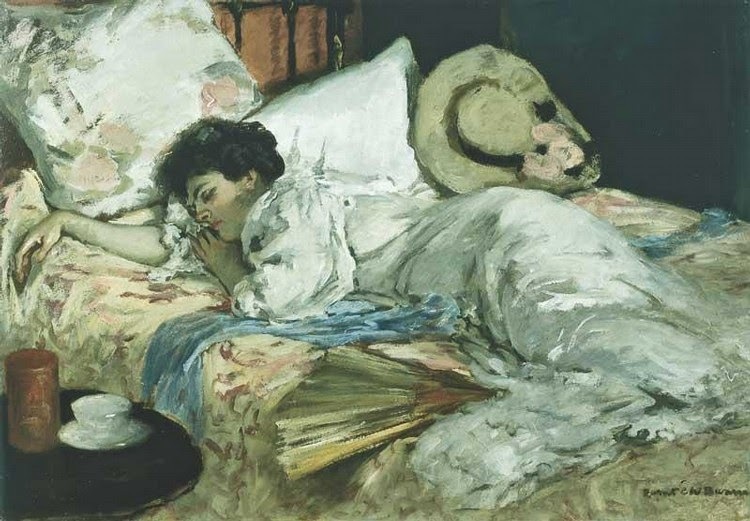 In this context one of our most significant finds has been an 1888 diary by Hungarian writer Zsigmond Justh, a close friend of Bunny in Paris. 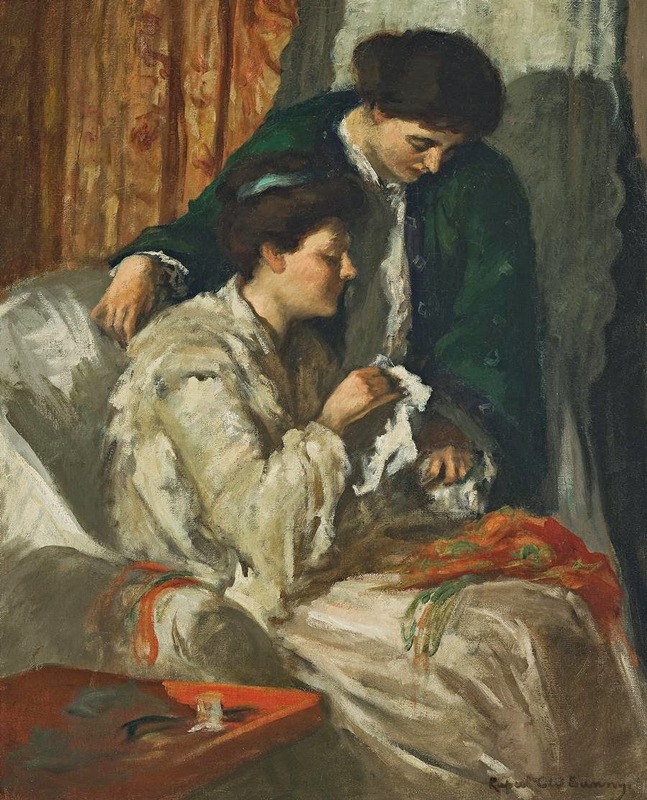 This journal provides a wealth of new information on the artist’s early life. 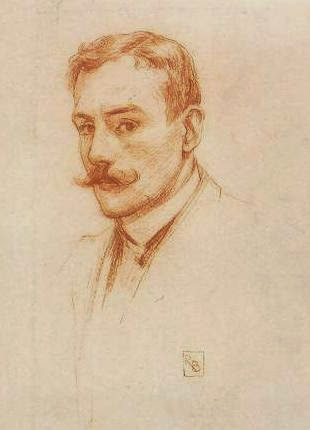 Bunny, was described by Justh as ‘six foot tall [with] curly blonde hair, pointy blonde beard and moustache in the French style’. 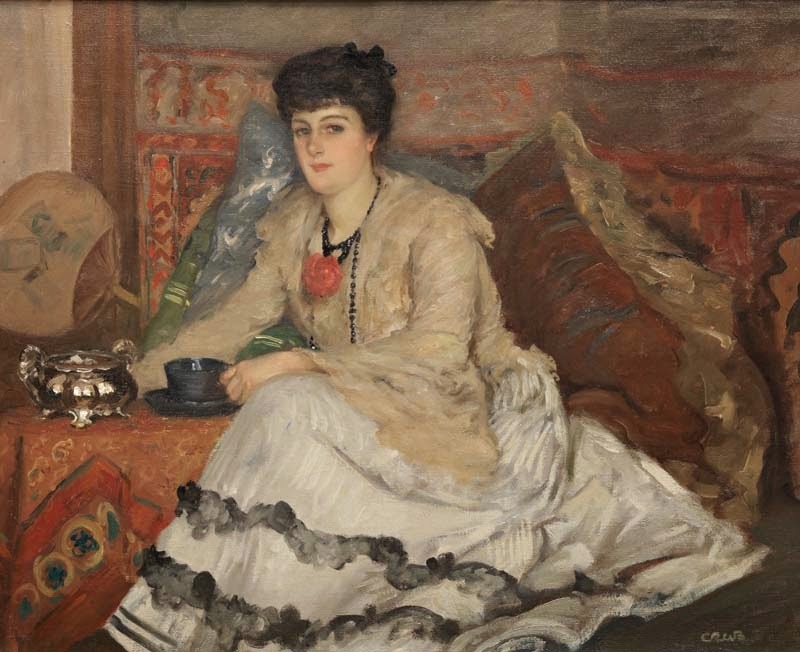 He was a frequent visitor to the theatres, concerts and renowned meeting places of Paris, an attendee at the apartment of Sarah Bernhardt and a regular at prominent literary and artistic salons. 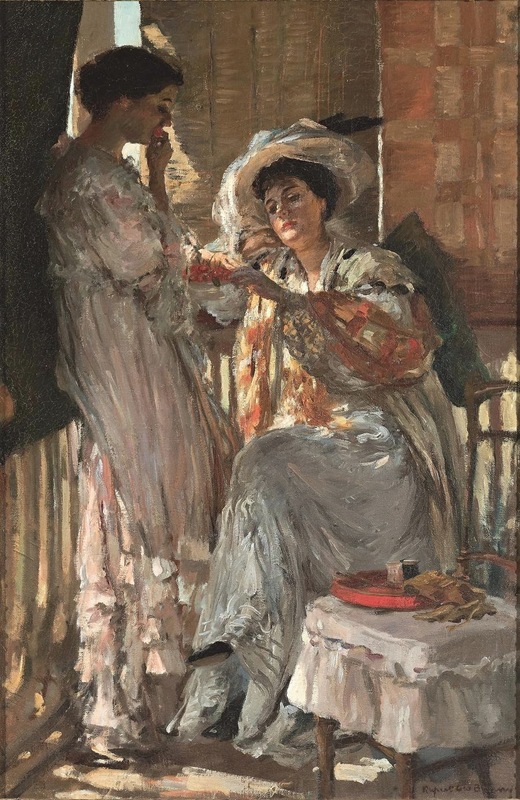 Bunny was the focus of consistently favourable attention from notable Parisian critics including scholar Gustave Geffroy (a friend of Monet) who first identified Bunny as a ‘brilliant and spirited artist’ in 1890. 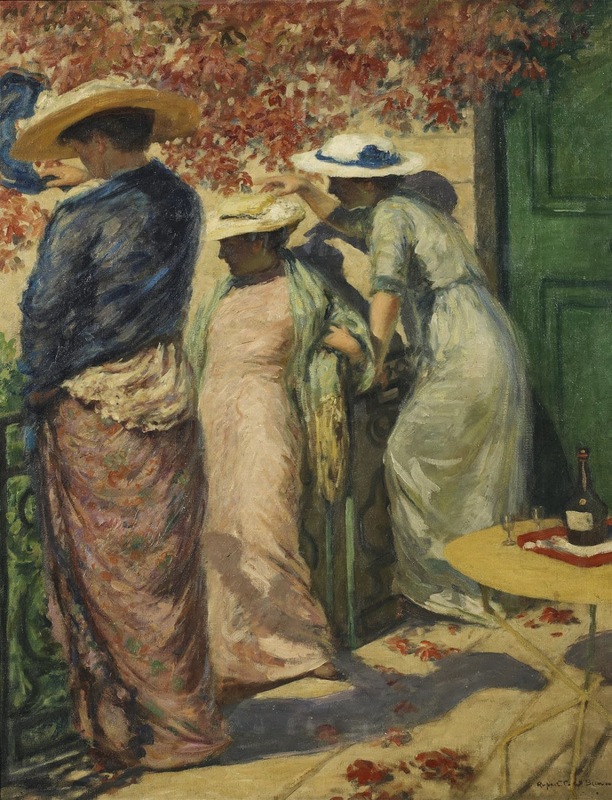 Coming to creative maturity in an era when the work of the Post-Impressionists was focused on increasingly powerful colouristic effects, Bunny developed as an exceptional colourist and decorative painter. 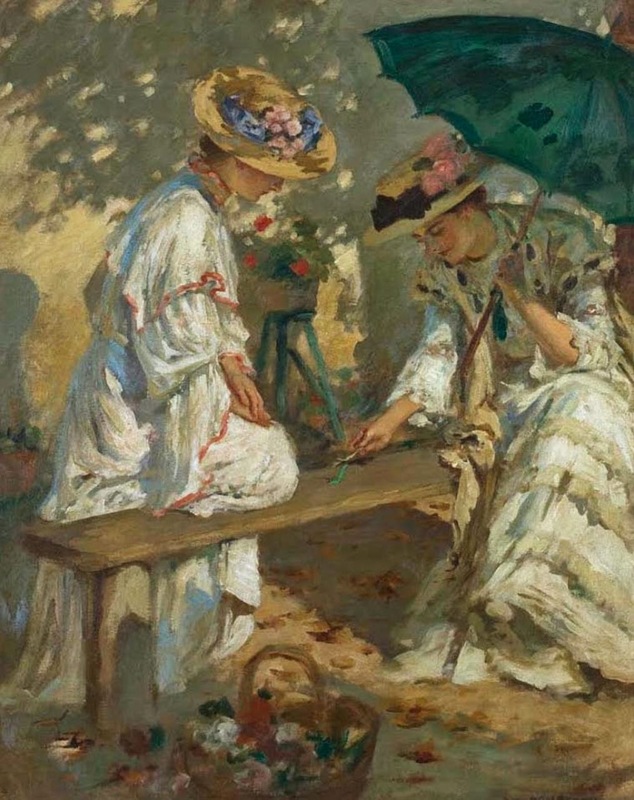 Over the 1890s and 1900s Bunny focussed almost exclusively on painting women; women at leisure, in gardens, at sea-side resorts and in parks. 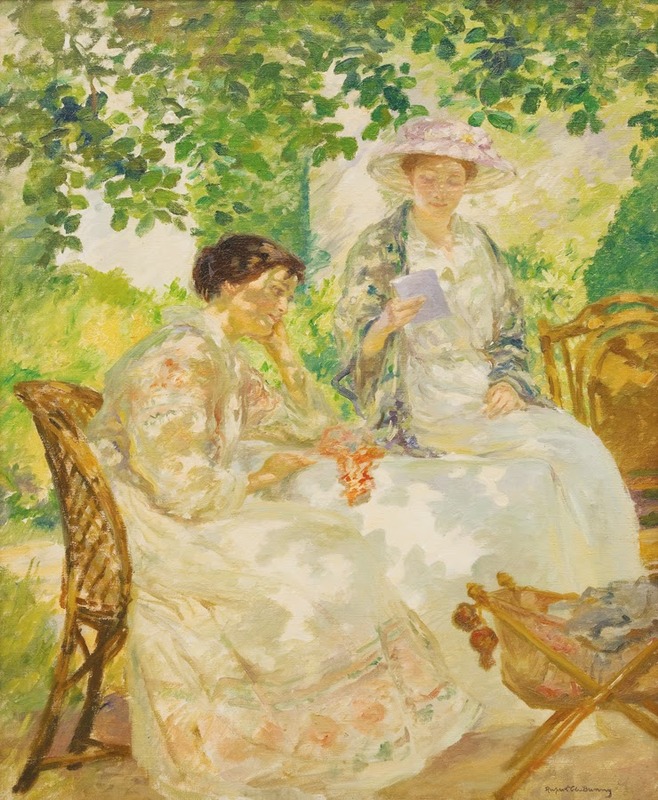 These highly successful works, like A summer morning, 1908, have been widely seen as epitomising the charm of France’s Belle époque; his subjects were beautiful women, fashionable frills, sun, sensuous music and glamour of an endless summer; soon be swept away by war. 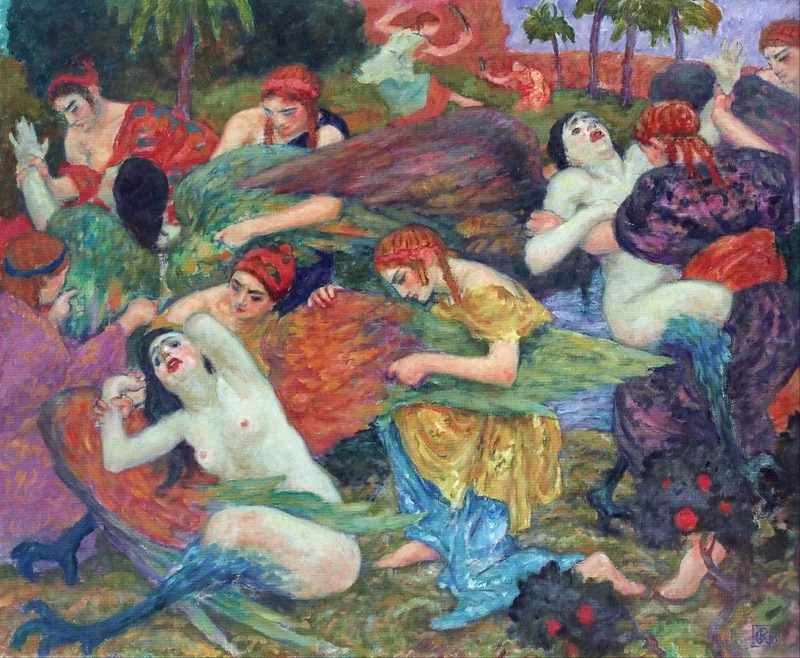 At the centre of Bunny’s imaging of women was his enigmatic wife Jeanne Morel who was the constant motif until he moved to a new preoccupation with Fauve-inspired mythologies from 1912. 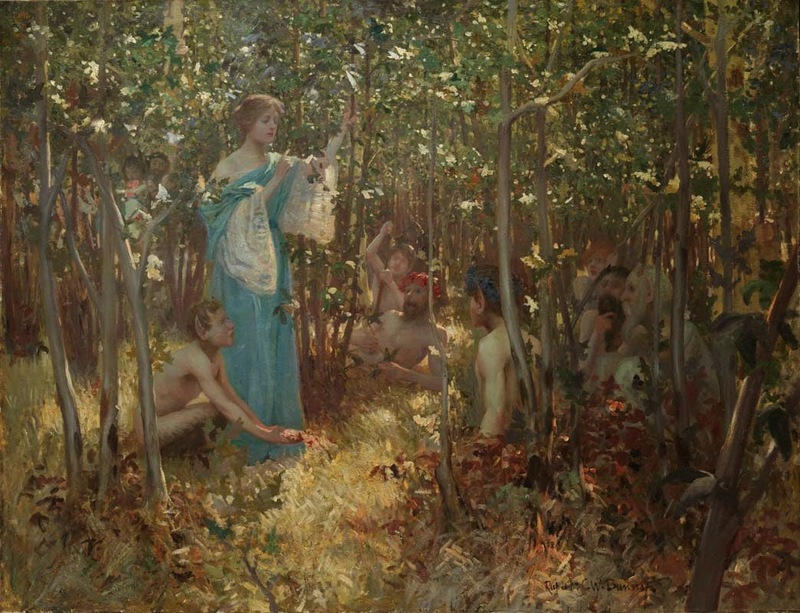 ‘a glorious riot of colour from the finest imaginative artist Australia has produced’. 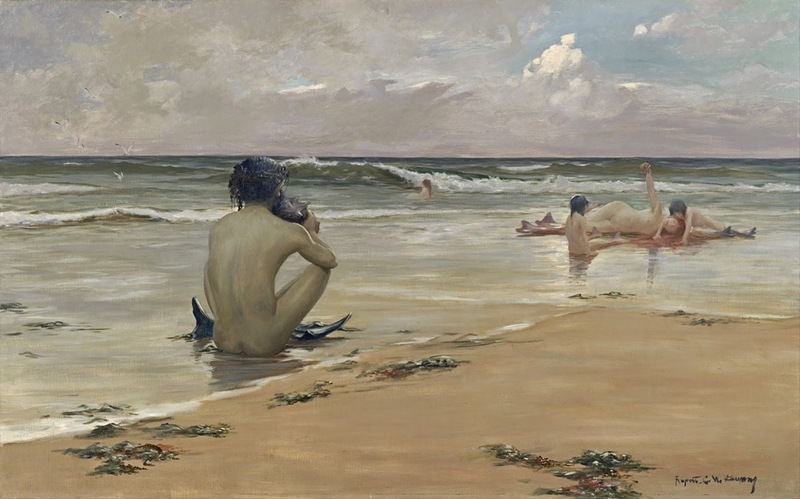 Rupert Charles Wulsten Bunny (29 settembre 1864-25 maggio 1947) è stato un pittore Australiano, nato a St Kilda, Victoria. 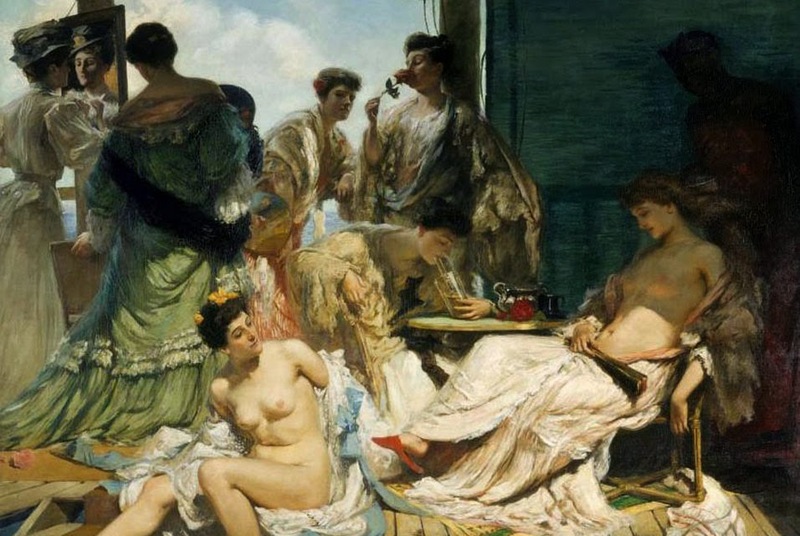 Ha raggiunto il successo di critica come espatriato nel fin-de-siècle a Parigi. 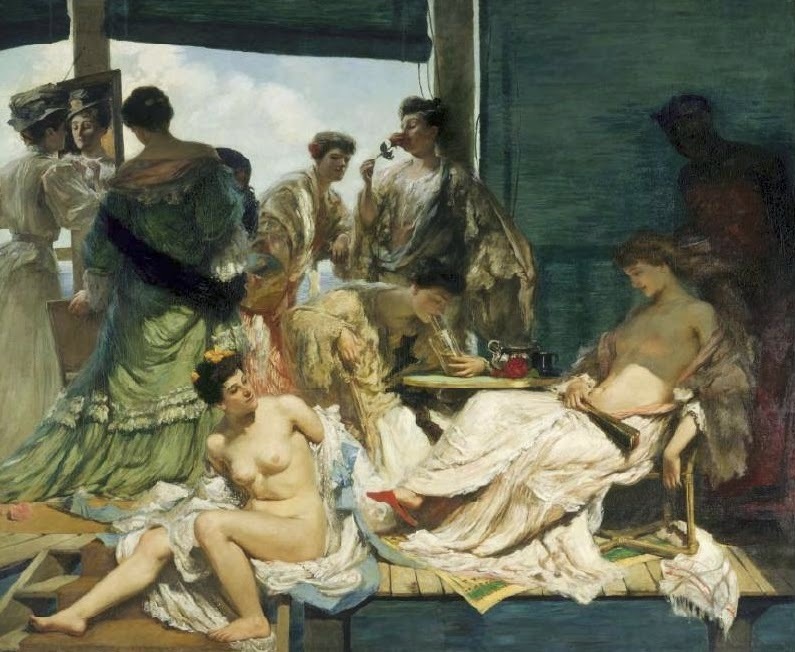 Ha ottenuto una menzione d'onore al Salone di Parigi del 1890, con i suoi tritoni pittura e una medaglia di bronzo al Paris Exposition Universelle nel 1900 con il suo Seppellimento di Santa Caterina d'Alessandria. 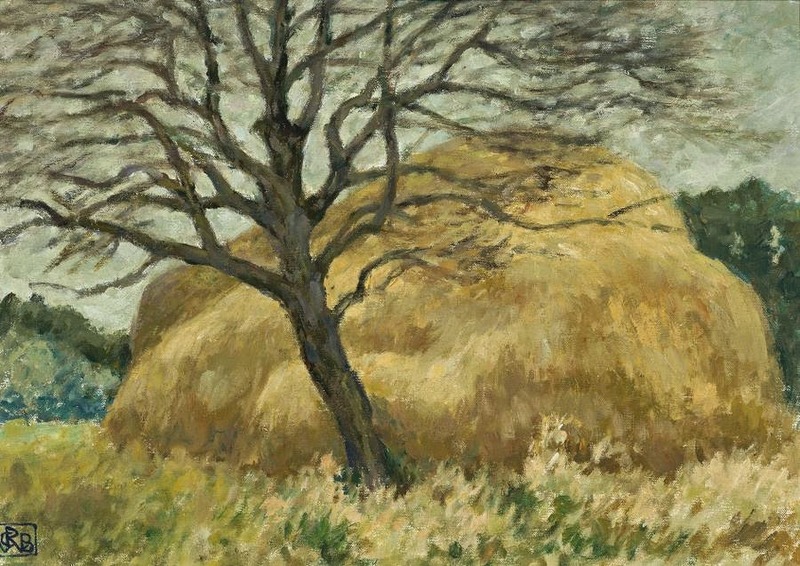 Lo Stato francese ha acquisito 13 dei suoi lavori per il Musée du Luxembourg e collezioni. 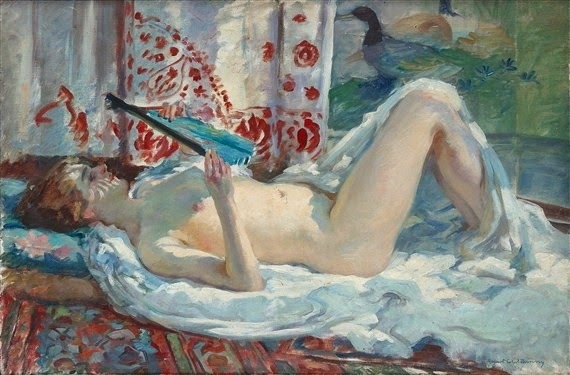 Era un "colorista sontuoso e pittore splendidamente erudito di temi ideali, e il creatore dei dipinti più ambiziosi prodotti da un australiano".